Cesar & Lois is a collective that formed in 2017 and probes the evolution of humanity’s relationship to nature by advancing intersections between the parallel networks of technology and biological systems. Cesar & Lois posit new systems that integrate natural and technological networks. 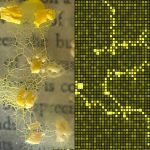 They create fungal systems that tweet and posit nature-based economies, subverting algorithms and infusing art with nature’s data. Cesar & Lois is a collective that creates microbiologically based digital systems in order to ask questions about how our systems grow societal frameworks for thought and value. Spanning two continents, Cesar & Lois invite viewers to renegotiate their interactions within systems, challenging our societies’ inherent logic models. Cesar & Lois nurture bhiobrid cultures, ranging from the fungal colonization of books to microbiological mappings, with the objective of learning from the overlapping patterns of human-based knowledge and the wisdom of nature’s growth algorithms. Cesar & Lois draw on biologists and undergraduate researchers to push their art in new directions. In 2018 Cesar & Lois exhibited at the L.A.S.T. Festival at the SLAC National Accelerator Laboratory at Stanford, CODAME in San Francisco, ISEA in Durban and the Brighton Digital Festival in the 2018 Lumen Prize exhibition. Cesar & Lois creates microbiologically based digital systems in order to ask questions about how our systems grow societal frameworks for thought and value. The collective formed in 2017 and probes the evolution of humanity’s relationship to nature by advancing intersections between the parallel networks of technology and biological systems. Spanning two continents, Cesar & Lois invite viewers to renegotiate their interactions within systems, challenging our societies’ inherent logic models. Cesar & Lois nurture bhiobrid cultures, ranging from the fungal colonization of books to microbiological mappings, with the objective of learning from the overlapping patterns of human-based knowledge and the wisdom of nature’s growth algorithms. Consisting of artists Lucy HG Solomon and Cesar Baio, Cesar & Lois draw on biologists and undergraduate researchers to push their art in new directions. Artist Jeremy Speed Schwartz and biologist Scott Morgans contributed to Degenerative Cultures. In 2018 Cesar & Lois exhibited at the L.A.S.T. Festival at the SLAC National Accelerator Laboratory at Stanford University, CODAME in San Francisco, ISEA in Durban and Brighton Digital Festival. Degenerative Cultures, which crosses nature and human systems, was the recipient of the 2018 Lumen Prize for Artificial Intelligence.